During our Branding module at Hyper Island, our client was a growing start-up in lung health. NuvoAir helps users easily manage respiratory health via spirometer device (lung measuring tool) paired with their digital apps. Our brief was to help bring clarity to NuvoAir’s growing product portfolio, as they were releasing a new product. Over 4 weeks time, we established NuvoAir’s brand strategy & created a communication concept. Coming from a branding background as a designer, my focus for the project was to broaden my skillset within branding by understanding a perspective of branding I was less familiar with - Strategy. My role: Strategist helping create NuvoAir’s brand platform & communication hierarchy, as well as Project Manager facilitating the team. The team consisted of six students. 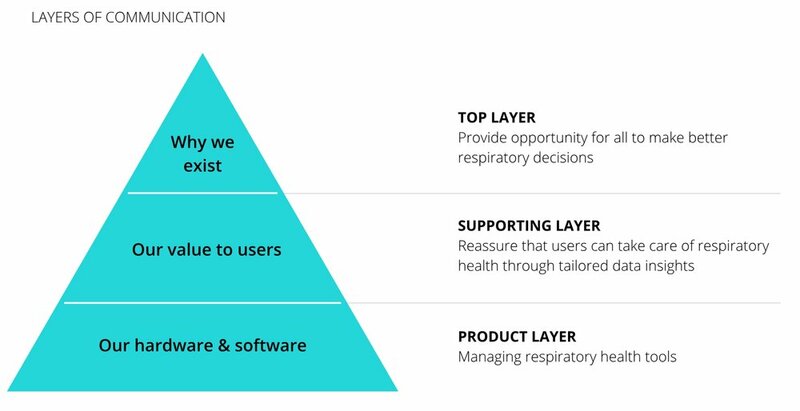 How do we bring clarity to respiratory health, if we don’t have clarity as a brand? Initially we were tasked with helping guide branding of the new product launch, but we quickly realized unclarity in product communication & internal misalignment was NuvoAir’s core issue. From patient interviews to meetings with the NuvoAir team - there was confusion about the brand itself & their products. Our focus shifted to addressing the brand’s strategy & communication, as these elements are the foundation for all their work moving forward. To be able to clarify both the brand strategy & communication, we had to establish core drivers for their three target audiences. Whether a patient is using the spirometer for personal use, looking to easily manage their lung health any time or a medical professional, looking to make better clinical decisions by receiving patients data in between hospital visits. Understanding these differences in needs was crucial. In helping the client establish a clear & united brand platform, the team facilitated a Google Venture Design Sprint to help ideate around the values, goals, future roadmap, & desired “personality” of the company. This session was done with NuvoAir’s CEO & Co-founder as well as their Director of Products. Using insights from our user research & our Google Sprint with the client, we established NuvoAir’s new brand platform. Providing NuvoAir with a clear vision, mission & company values to help guide them in future growth in both product development & communication of their offering. NuvoAir’s current communication is heavily product focused, with a lack of clarification in the differences between product families or why the company exists. We wanted to help lift their story & highlight the true value they provide users. Establishing a hierarchy of information to focus more on why they exist as a company & how they achieve value for users. At a top level introduction of themselves, how do they communicate the value they provide users? An inspirational statement that differentiates themselves from competitors & helps brand the company. Our proposal: Bridging the gap. 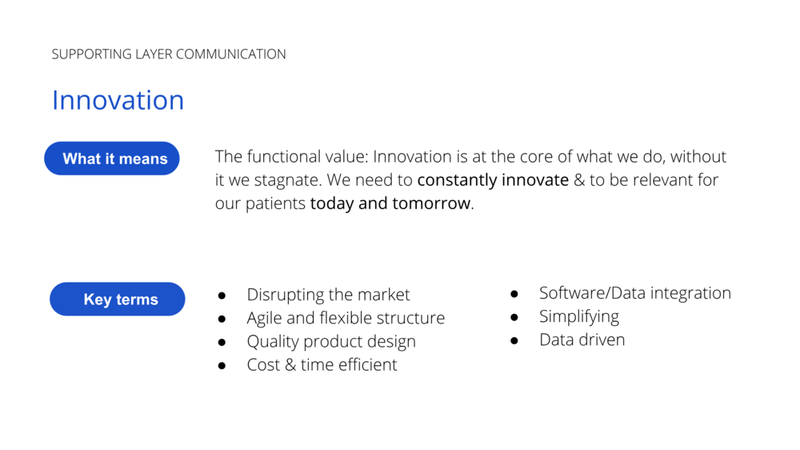 NuvoAir’s value is that they are bridging the communication gap between patients & physicians, helping improve the quality of care of users. Due to the fact NuvoAir has three distinct target groups, we wanted to find a concept that could adapt to the different needs of users. Being catered to each user group but still related back to the main concept of the brand as a whole. Along with a top level concept, we developed three areas of interest for NuvoAir to build secondary communication around the new concept of how they “Bridge the gap” — Innovation, Accessibility & Empowerment. These secondary areas demonstrate how NuvoAir helps create value for users & can be used to highlight their unique selling points. 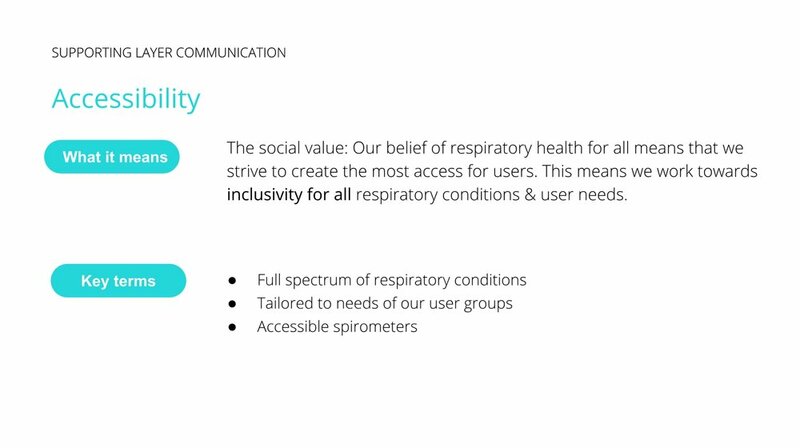 We provided keypoints as inspiration of what topics could be highlighted in communication to target their different user groups & their specific needs. Our focus for the project was helping clarify their brand via strategy & communication more than a visual rebrand. We used visuals as a way to illustrate our communication concept, using a refined version of their current visual identity.